Hello, I'd like to have an opinion on two identical Chinese vases that I bought on an antique auction in 1991 in Belgium, at that time calculated to Euro’s 440 €. 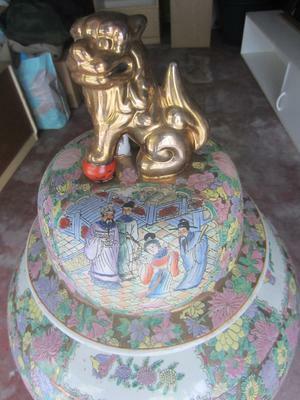 In the auction letter they were described as follow: Guangdong Porcelain of the late 19th century with red hand painted mark, decorated with gold plated dragon dog and typical old and colorful Chinese courtyard scene with flowers around. Can anyone help me to figure it out if those vases are real antique or cheap factory replica vases? 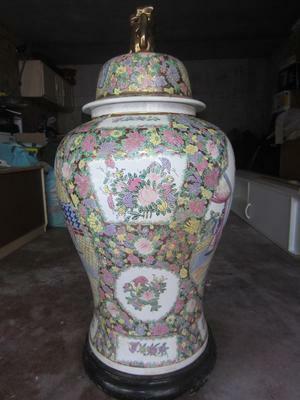 After seeing a similar vase on a second hand site, last month, I became suspicious. Never the less I still like both vases for decoration. Small, local auction houses generally don't have the expertise to identify Chinese porcelain, often not even their asian art specialists. I wouldn't advise buying items at face value. Many knowingly or unknowingly sell items that we know are fake. And this is not limited to porcelain. Thank you very much Peter, it's a bit disappointing that those vases are not more than some decades old. The antique auction was quite big, but the auction house was local and what I understood, not specialised in antique or better not in Oriental antique. Colors used in the 19th century were a little different, and the faces, etc. show something of the 20th century. You must have gotten it at a small auction, the big auction houses wouldn't possibly sell this as 19th century? 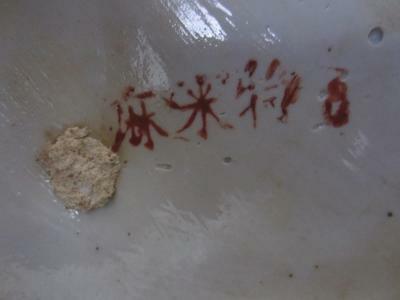 I don't know this mark and cannot tell if it was painted in Guangdong, but for above reasons it couldn't possibly have been made in the 19th century.